From My Front Porch: The Hession Fly!!!! Once Chris informed me that it was not "Haitian" it completely made sense that when I Googled "The Haitian Fly and winter wheat" I basically got nothing useful!!!! So now that I know it is a German fly and not one from Haiti I Googled again! There is a Hession Fly Free Date for planting your winter wheat - it is different in all regions and apparently there was some discussion amoung our neighbors as to the actual date - Chris thought it was Oct. 3, some thought it was Oct. 7 - lucky for us we planted yesterday took care of the Hession Fly either way! What is a Hession Fly was my question quickly followed by how (why) did a german fly get to Indiana? 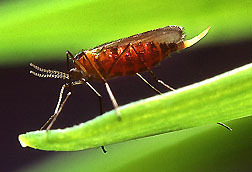 The Hessian fly was introduced into North America from Europe in the 1700s. In the United States, it can be found from Nebraska to the Atlantic, from Maine into the Piedmont areas of North Carolina, South Carolina, and Georgia, and in isolated areas west of the Rockies. In the past 20 years severe losses have been reported in Washington, Texas, Nebraska, Kansas, and Indiana. Wheat is the principle host plant of the Hessian fly. It may also be found on rye, barley and other wheat related species. In the midwest, Hessian flies are one of the most destructive pests of wheat. The maggots parasite between the leaf sheath and the stem and extract juices from the plant. Fall-infested wheat usually dies during the winter. Spring-infested wheat produces grain but usually lodges before harvest. Economic infestations are uncommon in North Carolina largely due to proper planting date selection. Probably a little more than anyone wanted to know about this particular fly but interesting none the less! 1) If we were to plant corn or soybeans we would not be able to empty our manure pits at a good time of the year to plow the manure in. 2) We are gaining a crop off of the acres not just leaving them idle for a year since we do need someplace to haul the manure. 3) The manure is factored into our fertilization plan for the ground and we move our acres of wheat every year to different fields. 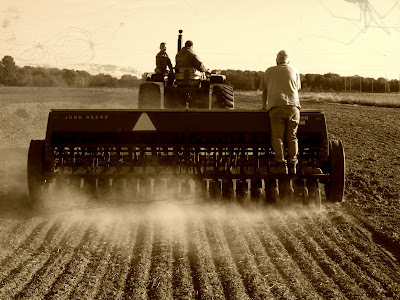 This year because the ground is so dry we started with running the turbo-till over the ground, then the disc and then had the culti-packer in front of the drill - a lot of trips over the ground but it really made for a nice level seed bed. 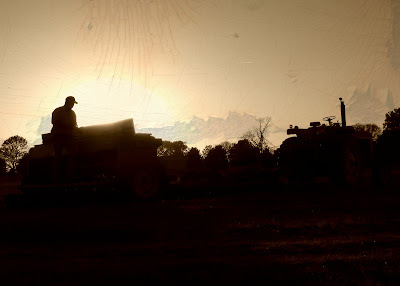 Chris planting wheat with his favorite tractor! The picture I took as I fell off the 4-wheeler while standing on it taking pictures of wheat planting! Chris and his Dad discussing the seed bed. The culti-packer and drill - it is so dry right now! Of course Hession Fly free or not without any moisture - ain't gonna be no wheat!!!!! I love this picture - 3 generations setting the drill! Chris checking the seed on the last round at sunset! Wow!! Thi whole entry was so interesting. I felt like I should be taking notes ---- I don't know why because I am not going to be planting wheat this year, or ever but nevertheless it was very informative and very interesting. We spread some winter wheat on our soon to be pastures...but wont have issues with those interesting flies since we arent going to be harvesting it...our cows will be eating it! Love the photos! I have seen a few farmers out there planting/drilling away! !